Assemblage, sculpture, and installation artist Maddy LeMel has been called a "scavenger poet." She is known for mixed-media constructions incorporating found objects that are reclaimed and given second lives in pieces created with wire, screen, thread, paper, metal fragments, and a deft articulation of light and space. 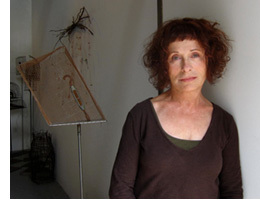 In an essay for the show, Constance Mallinson, a Los Angeles-based painter and critic who has written catalogues for exhibitions and reviews for such publications as Art In America, wrote, "Through combinations of the most ordinary objects that mysteriously morph into potent symbols and allegories of shifting human emotions, conditions, and situations, transformation has come to define the sculpture of Maddy LeMel." With her latest work, LeMel balances the notion of actual physical confinement with self-inflicted prisons of emotion, convention, and habit. "Stepping outside our familiar worlds could cause us to plummet to the ground," she says, "or perhaps we would learn to fly."